Springfield College’s women’s gymnastics hosted the Eastern College Athletic Conference Championship in Blake Arena on Saturday, March 8. The team took fourth for the second consecutive year. 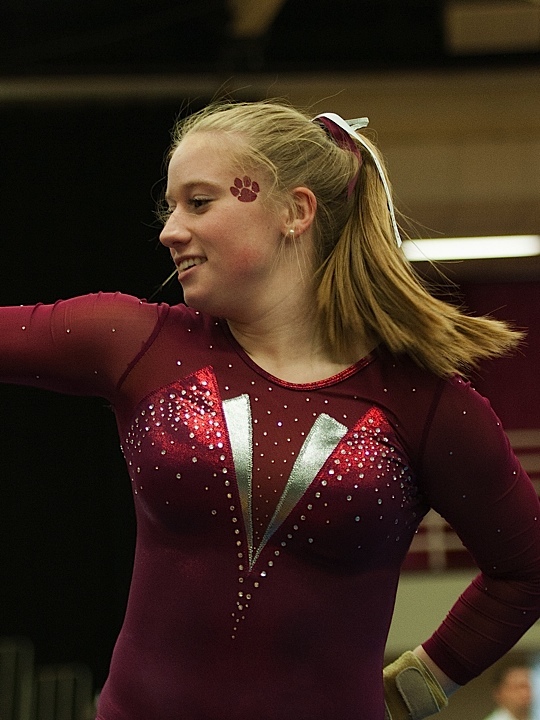 The six teams in Blake Arena on Saturday afternoon have made up 29 of the last 31 ECAC Division III Women’s Gymnastics Champions, including 25 in a row. The College at Brockport Golden Eagles found themselves on top of the podium for the second consecutive season with a score of 188. The SUNY Cortland Red Dragons (186.775) and the Ursinus College Bears (185.525) rounded out the top three, which earned them an ECAC bid to Nationals. The Pride fell less than a point short with a score of 185.275. The Ithaca College Bombers (179.550) and the Rhode Island College Anchorwomen (173.725) finished fifth and sixth, respectively. Despite the disappointing team result, the Pride finished with some personal ECAC accomplishments. Junior Lauren Pocius received ECAC Co-Athlete of the Year, with Courtney Saucier of Rhode Island College. Pocius took sixth overall in the all-around with a 36.4 and posted a team-high on the uneven bars with a 9.5 on Saturday. The Pride’s 34-year head coach, Cheryl Raymond, and Cortland’s Gary Babjack were named the ECAC Co-Coaches of the Year. In addition to the season awards, Pride freshman Nicole Silva was the reigning Rookie of the Week this past week. On Saturday she posted a team-high on the vault with 9.425. Junior Abby Clark’s 9.4 put her just behind Silva’s finish. Clark continued her impressive day with the Pride’s top score in the floor exercise (9.525), on the balance beam (9.5), and in the all-around (37.55). Brockport State swept the vault and floor exercise podium en route to their championship. The Pride are in the home stretch of their 2014 season, as they look to cap it off at the NCGA Championships in Ithaca, N.Y. on March 21-22.